Adhere your heart die cut on center of your card. Since the heart die cut is in plain red color, adhere a printed heart cut-out which is smaller in size at the center of the die cut. Then, adhere the “LOVE” cut-out at the center of this 2nd heart. Apply glitter glue of different colors on the plain heart die cut and the “LOVE” cut-out, outlining the edges of the said items. 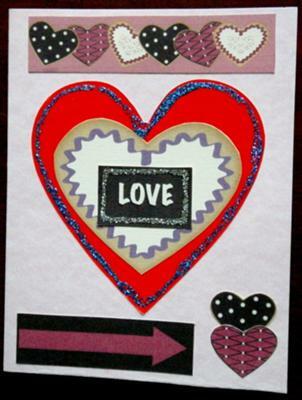 Position a heart border strip on top of the die cut or on the top part of your card. And position an “ARROW” cut-out on the lower left portion of your card. While, the (2) heart cut-outs on the lower right portion of your card.